Patrick Roy salutes the crowd as coach of the Quebec Remparts. 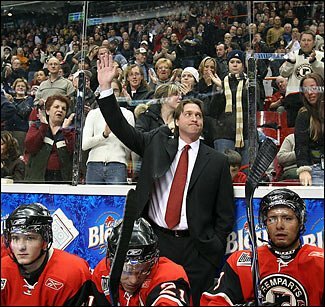 Patrick Roy has waited a long time for his 200th victory as the coach of the Quebec Remparts. Boone Jenner knew how to cap off a thrilling game for the Oshawa Generals. Friday may have been "Jordan Eberle and Colten Teubert Day" in Regina, but it wasn't their night. Olivier Roy is moving up in the Quebec Major Junior Hockey League record books. The London Knights barely survived a wild night against the Erie Otters. Even bringing in some help from the Everett Silvertips couldn't help the lowly Prince George Cougars. Richard Martel is now the winningest coach in Chicoutimi Sagueneens history. The Sudbury Wolves used the Oshawa Generals to rebound from Saturday night's loss. I thought that this was a very interesting week in the Canadian Hockey League. As usual, the play on the ice was exciting, but there were also a lot of quirky things going on during the games. First of all, from Saturday’s OHL report, the London Knights/Erie Otters match-up must have been incredible to watch. I assume that the London crowd was silenced when Erie scored five (!) unanswered goals to force extra time. Unfortunately, we didn’t have it on TV in the sports department, and we didn’t have a stringer at the game. Otherwise, I would have been able to have an even more interesting story, because the game score indicated that Erie’s last two goals were empty-netters, including one on the power play. That’s right, according to the game sheet, London pulled their goalie when they were up by two. You can imagine how much this confused me from my cushy seat at the Canadian Press. Since then, the game sheet has been fixed to show them as even-strength goals. Saturday night was also interesting in the WHL, with Prince George borrowing a goalie from the Everett Silvertips. The Cougars had been rolling with only one goaltender on their roster for a t least a week, so I suppose it was inevitable that they’d need an extra ‘keeper. I’m just 26, but I’ve never seen that happen in an organized hockey game before. With the junior hockey trade deadline on Monday there was also a lot of action off the ice with players changing teams. I mentioned this on Twitter, but the Chicoutimi Sagueneens have traded away many of their best players including Jacab Lagace and Nicolas Deschamps. As far as I can tell, the Sags are preparing for the 2010-11 season. Obviously, the QMJHL stories from Friday and Sunday were naturals as round-up toppers. First of all, you can’t go wrong talking about Patrick Roy. He’s easily one of the top three goalies, ever, and he’s probably going to become an NHL coach within the next three years. Then you have Richard Martel becoming the winningest coach in Sagueneens history. He’s one of the great coaches in the QMJHL and deserves accolades for his 223rd victory. However, as a writer/editor I also knew that with Chicoutimi in the midst of a firesale they likely won’t be at the top of a round-up any time soon. Also, I’m not sure how much longer I could resist calling Martel a “model” to his players. One other thing to note: I did not write any WHL stories on Sunday because my shift would have been seven or eight hours long. Instead, one of my co-workers wrote it. You can see it here: WHL: Reddick nets two goals as Americans blank Bruins. Citizen Kane Syndrome » « What does a Junior Hockey Editorial Assistant do, exactly?